BACKGROUND AND PURPOSE: Vertebroplasty and kyphoplasty can be associated with significant radiation exposure to the operator. We compared the exposure levels to an operator performing vertebral fracture augmentation with vertebroplasty and kyphoplasty, to assess a cement injection and a monitoring technique designed to reduce this exposure. METHODS: A neuroradiologist performed 189 consecutive vertebral augmentation procedures in 135 patients with osteoporotic compression fractures by using a bilateral approach with biplane pulse fluoroscopy at 7.5 pulses/second. Cement delivery was performed with intermittent fluoroscopy with kyphoplasty and vertebroplasty by using syringes or continous fluoroscopic monitoring with a cement delivery system (CDS). Data collection included time and operator exposure parameters. RESULTS: A total of 87 kyphoplasty procedures, 82 vertebroplasty procedures with a CDS (VP-CDS), and 20 vertebroplasty procedures with syringes (VP-S) were safely performed. Mean fluoroscopy time for device positioning was 4.3 minutes for each procedure type. Mean fluoroscopy time (minutes) for cement delivery was significantly different for the 3 procedure types; 2.1 for kyphoplasty, 3.7 for VP-CDS, and 1.5 for VP-S (P < .0001). Comparable mean radiation exposure rates (microsieverts/minute) were 0.8 for kyphoplasty, 1.1 for VP-CDS, and 0.3 for VP-S during device-positioning and 1.7 for kyphoplasty, 2.9 for VP-CDS, and 0.2 for VP-S during cement injection (P < .002). CONCLUSION: Use of the modified cement injection technique and intermittent fluoroscopy with kyphoplasty and vertebroplasty with syringes results in a significantly lower operator exposure rate compared with vertebroplasty with a CDS. Approximately 700 000 osteoporotic vertebral compression fractures occur each year in the United States.1 Since their introduction within the past 2 decades, vertebroplasty and kyphoplasty have become established techniques for treating painful osteoporotic or neoplastic vertebral compression fractures of the spine.2,3 These are percutaneous procedures that require a brief recovery, are performed on an inpatient and outpatient basis in a hospital setting, and are now being performed in ambulatory care centers. Most vertebral augmentation procedures are performed with a multidirectional fluoroscope. Prolonged fluoroscopic monitoring in multiple imaging planes is required for both needle and instrument placement, as well as for delivery of radiopaque acrylic cement into the target vertebra. The radiation exposure to patients, operators, and operating room personnel, therefore, is a concern.4,5 Radiation exposure to the operator during vertebroplasty or kyphoplasty is not trivial and should be kept to levels as low as reasonably achievable in every procedure. The purpose of our study was to compare the radiation exposure levels to an operator performing vertebral fracture augmentation with vertebroplasty and kyphoplasty and to assess whether a modified cement injection monitoring technique can reduce this exposure. A single neuroradiologist performed 189 consecutive vertebral augmentation procedures in 135 patients with osteoporotic vertebral compression fractures. Informed consent was obtained before each procedure. All patients were sedated with intravenous propofol and were monitored by an anesthesiologist. Strict aseptic technique was used in all cases but not routine antibiotic prophylaxis. Only 3 of the procedures were performed on inpatients; and the remainder, on an outpatient basis. The procedures were performed in the radiology interventional suite by using a biplane angiography unit (Philips Integris V5000, Eindhoven, the Netherlands) with pulsed fluoroscopy at a rate of 7.5 pulses/second. The room design required that the operator perform all procedures on the same side as the lateral x-ray tube. Institutional review board exemption for this study was obtained. All procedures were performed with the patient in the prone position. The same types of radiation-shielding devices were used in all patients, and the device position was kept constant for all patients. A 0.5-mm lead-equivalent apron was draped over the buttocks and upper thighs of the patient. After the operative site was prepped and draped, a sterile disposable bismuth-containing surgical drape (RADPAD, Worldwide Innovations & Technologies, Overland Park, Kan) with radiation-protection properties, was placed on the patient just caudal to the operative site. A lead drape was attached to the fluoroscopy table to reduce radiation exposure from underneath the table. A 0.5-mm lead-equivalent mobile barrier was placed between the operator, lateral x-ray tube, and the patient. This mobile barrier was covered with a sterile snap cover and could be easily positioned by the operator during the procedure. Strict collimation techniques were used for both imaging planes during fluoroscopy. Additional radiation safety techniques included the active monitoring and recording of fluoroscopy time during the procedure. A personal radiation monitor (Bleeper III, Vertec Scientific, Reading, UK) was worn on the operator’s left-handed vest pocket, the side closest to the lateral x-ray tube. This audible warning device provides instantaneous audio feedback to the operator, consisting of a loud chirping noise that is proportional to the operator’s radiation dose during fluoroscopy (1 chirping noise every 20–30 minutes for background radiation to a continuous chirp at radiation levels that exceed 100 mR/hour). An electronic digital pocket dosimeter (MYDOSE Mini-X; Aloka, Tokyo, Japan) was also placed on the operator’s left-handed vest pocket. This device complies with International Commission on Radiological Protection (ICRP, publication 74) codes and the definition of the Nuclear Regulatory Commission on effective dose-equivalent6–8 and was used to record operator radiation exposure in microsieverts (taking into consideration the beam-quality-weighting factor and tissue-weighting factor). For the purposes of this study, all procedures were separated into 2 portions, device-positioning and cement delivery. Device-positioning consisted of the placement of bilateral bone needles under fluoroscopic guidance by using a transpedicular approach. Kyphoplasty required additional instrumentation steps including a coaxial exchange of the bone needle over a guidepin for a larger working cannula. A hand drill was advanced through the working cannula to create a working channel. An inflatable balloon tamp could then be advanced into the working channel with subsequent inflation of the balloon with radiopaque contrast media by using an inflation device. Fluoroscopy was used judiciously so that the operator would only activate the fluoroscope when localizing, adjusting, or advancing a surgical instrument. Every reasonable attempt was made to exploit the inverse-square law of radiation exposure during fluoroscopy; the operator would step away from the operative field whenever possible and as far as possible to minimize radiation exposure. Fluoroscopy time, as noted on the fluoroscopy timer, and radiation exposure, as noted on the pocket dosimeter, were recorded for this portion of the procedure. The second portion of all of these procedures consisted of the delivery of radiopaque acrylic bone cement (opacified with 30% by weight of sterile barium). Cement delivery in kyphoplasty was modified so that it was performed with small bolus injections (<0.3 mL) with 1.5-mL bone-filler devices by using intermittent fluoroscopy instead of continuous fluoroscopy. Cement delivery in vertebroplasty with a cement delivery system (CDS) (EZ flow CDS, Parallax Medical Corp, now Arthrocare, Sunnyvale, Calif) required continuous fluoroscopic monitoring at a fixed distance of 43 cm from the bone-needle attachment site. Continuous fluoroscopic monitoring is frequently used in these procedures with a CDS or injection of larger boluses of cement. Cement delivery in vertebroplasty with syringes (VP-S) was performed with 0.2-mL bolus injections with 1-mL Luer-Lok syringes (BD, Franklin Lakes, NJ) by using intermittent fluoroscopy. The use of intermittent fluoroscopy enabled the operator to step away from the operative field and increase the distance from the radiation source during activation of fluoroscopy mode. Pertinent data collection included the following: the date of procedure, procedure type, vertebroplasty with CDS (VP with CDS), VP with syringes, or kyphoplasty; total procedure time (minutes); fluoroscopy time (minutes) for device-positioning and for cement delivery; operator radiation exposure (microsieverts) during device-positioning and cement delivery; cement volume (milliliters); and vertebral body level (thoracic or lumbar). Summary statistics were obtained for these parameters. These data enabled the calculation of mean exposure rates (radiation for unit time) for the 2 major components, device-positioning and cement injection, for each procedure type. Dependent variables were compared among all 3 groups by using a 1-way analysis of variance (ANOVA) to assess statistically significant differences between the 3 procedure types. A Tukey studentized range (HSD) test was used to make all pairwise post hoc comparisons when the omnibus F-test was significant. Means are expressed with their associated 95% confidence intervals (CI). A total of 87 kyphoplasty procedures, 82 VP-CDS procedures, and 20 VP-S procedures were performed without complications. The patient population consisted of 114 women (84%) and 21 men (16%) with an average age of 75.8 years (range, 43–93 years). Of the 87 kyphoplasty procedures, 42 (48%) were performed in the thoracic spine and 45 (52%) were performed in the lumbar spine. Of the 82 VP-CDS procedures, 52 (63%) were performed in the thoracic spine and 30 (37%) were performed in the lumbar spine. Eight (40%) of the 20 VP-S procedures were performed in the thoracic spine and 12 VP-S procedures (60%) were performed in the lumbar spine. Summary statistics for time measurements for each of the 3 procedure types are shown in Table 1. The mean total procedure time in minutes was longer for kyphoplasty (55.7 [13.0]; 95% CI, 53.0–58.5) when compared with either VP-CDS (44.2 [14.0]; 95% CI, 41.6–46.8) or VP-S (39.3 [11.6]; 95% CI, 35.6–43.0) (Tukey test, P < .0001). The mean needle and/or device-placement fluoroscopy time for the 3 procedure types was not significantly different. Cement delivery fluoroscopy time, however, differed significantly between kyphoplasty (2.1), VP-CDS (3.7), and VP-S (1.5) (1-way ANOVA, P < .0001). 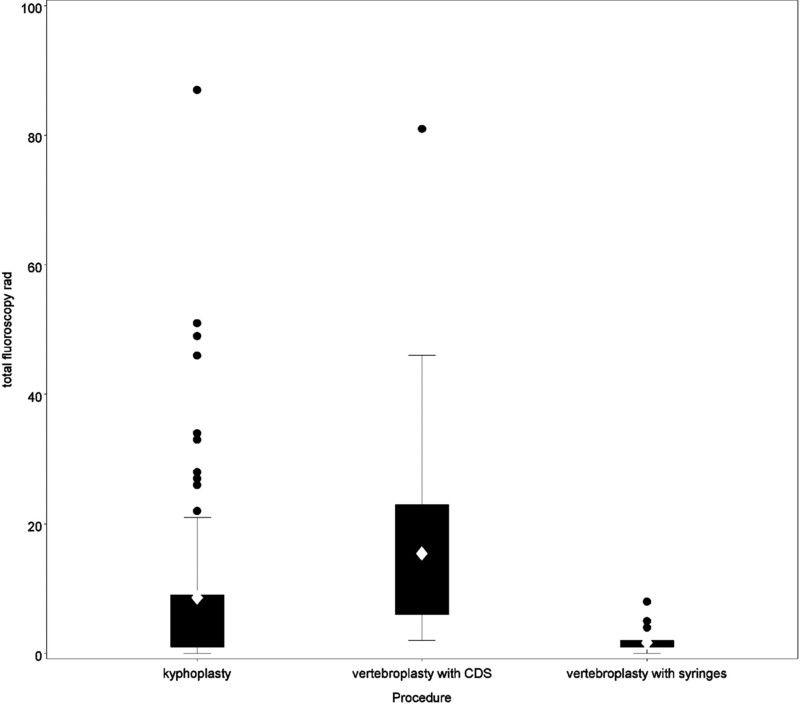 This difference occurred with average cement volumes that were greatest for kyphoplasty (3.9 [1.3 mL]; 95% CI, 3.6–4.2), least for VP-CDS (2.9 [0.9 mL]; 95% CI, 2.7–3.1), and intermediate for VP-S (3.3 [0.7 mL]; 95% CI, 2.9–3.6) (Fig 1). A statistically significant difference in cement volume was observed between kyphoplasty and the 2 vertebroplasty procedure groups (Tukey test; P < .03). Box plot shows polymethylmethacrylate (PMMA, Codman Cranioplastic, Raynham, Mass) volume by procedure. The mean cement volume in kyphoplasty is significantly greater than that in the 2 vertebroplasty procedures (P < .03). Summary statistics for operator exposure measurements (microsieverts) for each of the 3 procedure types are shown in Table 2. With respect to the needle-/device-positioning portion of the procedure, mean operator exposure was similar between kyphoplasty and VP-CDS and significantly lower for VP-S when compared with the former procedures (Tukey test; P < .02). Mean operator exposure during cement delivery was significantly greater for VP-CDS compared with kyphoplasty and VP-S (Tukey test, P < .0002) but not significantly different between kyphoplasty and VP-S. Mean total operator exposure was greatest for VP-CDS (15.4 [13.3], 95% CI, 12.5–18.4 μSv); intermediate for kyphoplasty (8.6 [13.9], 95% CI, 5.7–11.6 μSv); and least for VP-S (1.7 [1.9], 95% CI, 0.8–2.6 μSv); and these differences were significant (1-way ANOVA, P < .0001) (Fig 2). There were slight differences in total mean operator exposure with respect to thoracic-versus-lumbar level for kyphoplasty and VP-S but not VP-CDS. For kyphoplasty, the total mean operator exposure in the lumbar spine was 10.7 ± 13.6 μSv and 6.5 ± 14 μSv in the thoracic spine. In lumbar VP-S, the total mean operator exposure was 1.9 ± 2.5 íSv, compared with 1.4 ± 0.5 μSv with thoracic VP-S. Total mean operator exposure for VP-CDS in the lumbar spine was 15.8 ± 9 μSv; and in the thoracic spine, 15.2 ± 15.3 μSv. Because the operator could stand farther away from the thoracic spine during kyphoplasty and VP-S, mean exposure was lower for thoracic spine procedures. Despite this trend, however, these results did not achieve statistical significance. Box plot shows mean total operator exposure by procedure. The mean total operator exposure was significantly different among the 3 procedure types (P < .0001) and greatest for VP-CDS. rad indicates radiation. With data available for both operator exposure and fluoroscopy time, it was possible to calculate average operator exposure rates (microsieverts/minute) for the 2 distinct portions of each procedure type (Table 3). 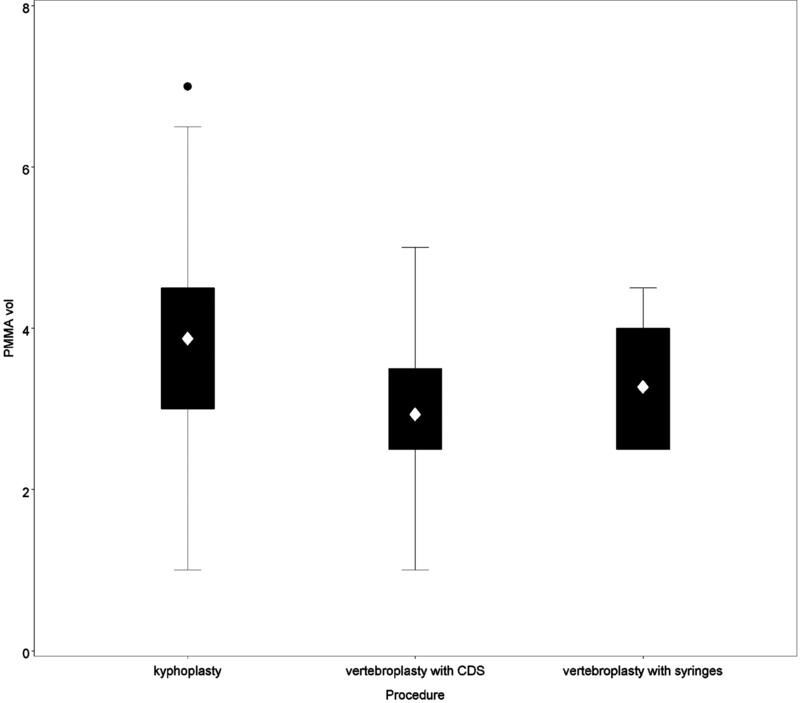 The average operator exposure rate, during needle- and/or device-positioning, was not significantly different between kyphoplasty and VP-CDS but was significantly different between kyphoplasty and VP-S and between VP-CDS and VP-S (Tukey test; P < .001). With respect to average operator exposure rates during cement delivery, a significant difference was observed among all 3 procedures (Tukey test; P < .0001) (Fig 3). This effect carried over into the mean total operator exposure rate, which was also significantly different among the 3 procedure types (P < .02) and again greatest for VP-CDS (1.9 μSv/minute) (Table 3). Furthermore, the data for the most recent 20 procedures of each type, kyphoplasty, VP-CDS, and VP-S, were compared to assess the fluoroscopy time and operator exposure parameters at a similar level of operator experience. Mean procedure time for these procedures was not significantly different and was 45.3 ± 9.1 minutes for kyphoplasty, 46 ± 11.7 minutes for VP-CDS, and 39.3 ± 8 minutes for VP-S. All other mean values for fluoroscopy time, exposure, and exposure rate were significantly different between kyphoplasty and VP-CDS and between VP-S and VP-CDS but not between kyphoplasty and VP-S (Tukey test, P < .0001). Mean fluoroscopy time for kyphoplasty was 5.4 ± 1.3 minutes; for VP-CDS, 8.0 ± 2.3 minutes; and for VP-S, 5.4 ± 2.6 minutes. Mean total operator exposure for each procedure was kyphoplasty, 1.0 ± 1.0 μSv; VP-CDS, 8.9 ± 6.7 μSv; and VP-S, 1.7 ± 1.9 μSv. The mean total operator exposure rates for the most recent 20 procedures of each type were 0.19 ± 0.19 μSv/minute for kyphoplasty, 1.13 ± 0.84 μSv/minute for VP-CDS, and 0.3 ± 0.27 μSv/minute for VP-S. Box plot shows mean radiation exposure rates (microsievert per minute) during cement delivery for each procedure. Significant differences were seen between each procedure (P < .0001), with mean exposure rate being greatest for VP-CDS (2.88 μSv/min). During the relatively short history of clinical application of vertebroplasty and kyphoplasty, only a few articles in the literature have attempted to discuss radiation dose and protection during these procedures.11 Our mean total fluoroscopy time for kyphoplasty (6.5 minutes) is similar to that reported in a recent small series of 11 patients (10.1 minute).4 A single multiplanar fluoroscopy system was used in this latter study. In the case of vertebroplasty, our fluoroscopy time data for cement injection (VP-CDS, 3.7 minutes; VP-S, 1.5 minutes) are similar to those reported in a study by Kallmes et al,12 using the same CDS for VP-CDS and VP-S (VP-CDS, 8.1 minute; VP-S, 4.7 minutes). In the latter study, the procedure is performed by an operator using a biplane fluoroscopy system in which the lateral and anteroposterior fluoroscopy data are reported separately. The cement injection volumes were slightly higher in the current study (VP-CDS, 2.9 mL; VP-S, 3.3 mL) compared with those of Kallmes et al (VP-CDS, 2.1 mL; VP-S, 2.3 mL). These differences may reflect differences in operator preferences and in procedural technique. Hand exposure rates, as measured by a radiation dosimeter worn on the operator’s left wrist, were measured by Kallmes et al, who reported rates of 7.3 mrem/minute (73 μSv/minute) for VP-CDS and 23.6 mrem/minute (236 μSv/min) for VP-S. These exposure readings reflect the effects of direct operator radiation exposure with the hand in close proximity to the path of the x-ray beam during continuous fluoroscopic monitoring, while injecting cement with syringes or with continuous fluoroscopic monitoring required with use of the CDS. Continuous fluoroscopic monitoring is used by most practitioners during cement injection to monitor cement distribution and to avoid and/or minimize cement extravasation beyond the vertebral body. The difference in cement injection times between VP-CDS and VP-S was statistically significant in both Kallmes et al12 and our study, with longer fluoroscopy times required to monitor cement injection with a CDS. Kruger et al5 measured hand and body exposure rates with a different CDS and recorded mean values of approximately 36 μSv/minute for hand exposure and 1 μSv/min for body exposure at a pulse fluoroscopy rate of 8 per second. The distance from the delivery chamber of this device to the needle measures approximately 38 cm. 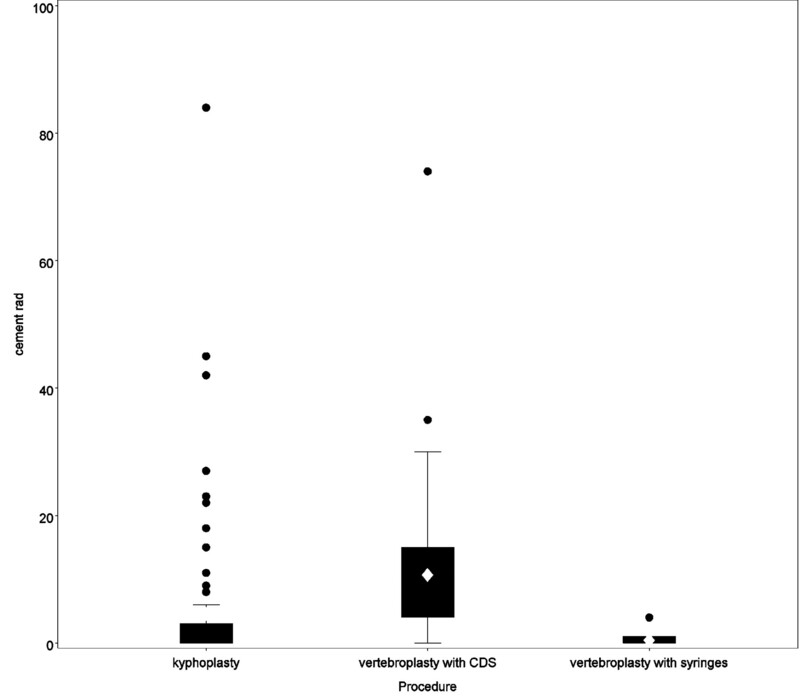 Our experience with operator body-exposure rates during cement delivery for kyphoplasty (1.7 μSv/min), VP-CDS (2.9 μSv/min), and VP-S (0.2 μSv/min) is relatively comparable with respect to vertebroplasty with syringes and kyphoplasty (Table 3). With standard use of these radiation monitoring and radiation-attenuating devices, another variable that could be modified was fluoroscopy technique. The use of small bolus injections of cement enabled us to alter the way that cement injection is usually monitored, with continuous fluoroscopic visualization. By applying this different technique, the operator could step away from the fluoroscope during active fluoroscopic monitoring. Use of an increased distance from the radiation source was possible with both kyphoplasty and VP-S and allowed successful use of the inverse-square law (ie, the operator could step away from the operative field during active fluoroscopy). Device-positioning could be performed by using intermittent fluoroscopy for all 3 procedure types, thereby allowing the operator to step away from the operative field. Hence, the operator body exposure rates did not differ substantially during the device-positioning portion of the procedure (Table 3). Small bolus injections of cement could be safely administered with the use of intermittent fluoroscopy and increased operator distance from the operative field. VP-CDS, in contrast, required the use of continuous fluoroscopy at a fixed distance (43 cm with this specific CDS in our study). Our study results, therefore, show a statistically significant difference in operator-body exposure rates between kyphoplasty and VP-S compared with vertebroplasty with a CDS. CDSs were initially developed for the vertebroplasty procedure.15 These devices were designed to facilitate the controlled, contained, and consistent preparation of acrylic bone cements. The use of these systems avoids the need for repetitive connections with 1-mL syringes. These CDSs, as shown by Kallmes et al,12 reduce operator-extremity exposure by removing the hand from the vicinity of the primary radiation source.10 It has been presumed by many manufacturers and operators that a secondary benefit of these CDSs is radiation-dose reduction to the operator by increasing the distance between the operator and the injection site and, hence, the radiation field. This expected benefit, however, as seen in our study, has not been completely realized. The distance from the operative field, as determined by the length of the extension tubing, does not appear to be sufficient to fully exploit the advantages of the inverse-square law. In addition, the time required for cement injection with these devices appears to be greater than that observed with other cement administration systems, such as syringes or bone-filler devices. This was a consistent observation not only in our study but also in the study by Kallmes et al. This study was prospective, and the decision as to whether to perform a vertebroplasty or a kyphoplasty was based on the age and morphology of the fracture. In general, kyphoplasty was used to treat fractures that were present for <6 months and were not associated with severe height loss. As previously stated, the syringe system was not used until later in the study. This would certainly introduce an element of operator-experience bias into the analysis of the 3 procedure types. Further analysis of our data showed similar mean total operator exposure rates when comparing the last 20 kyphoplasty (0.19 μSv/min) procedures with the 20 VP-S (0.3 μSv/min) procedures. The last 20 VP-CDS procedures still had mean total exposure rates (1.13 μSv/min) that were significantly higher than those of the other 2 procedure subtypes. Procedure-related limitations were also encountered in this study. Our study with a CDS reflects the use of only 1 model. There are a few other commercially available CDSs. Although a formal comparison of distance between patient and operator with these systems was not performed, the authors are currently not aware of commercially available tube lengths that might facilitate increased operator distance from the radiation source and, thereby, reduce operator radiation exposure. The CDS used by Kruger et al 5 places the operator at an approximately similar distance from the operative field as was observed in our study (38 cm with the commercially available model of their CDS and 43 cm with the CDS in our study). Our study did not attempt to measure radiation exposure to the operator’s hand, which limits the comparison with Kallmes et al.12 Our monitoring device would not enable us to measure hand dose. Another limitation of our study is that we did not record patient morphometric data. Because an important component of operator radiation exposure is related to patient scatter, this might be an important factor in larger patients. The relatively large number of patients in the kyphoplasty and VP-CDS groups would help to minimize any patient bias with respect to patient size. Also, we did not observe a significant difference in exposure rates with respect to thoracic-versus-lumbar level within a specific procedure type. Our study did not include patients with neoplastic lesions. Radiation exposure could theoretically be greater for these procedures in the setting of osteolytic lesions that require meticulous fluoroscopic monitoring during cement injection. We are not aware of other studies that have attempted to compare occupational radiation exposure rates with these 3 different vertebral augmentation techniques. The current recommendations for annual effective-dose limits for occupationally exposed personnel is 50 milliSv/year and 500 milliSv/year for extremity exposure, with a cumulative occupation exposure of 10 milliSv times the age of the operator.6,7 Using these 2 recommendations, the lifetime risk for the development of fatal cancer by an operator is approximately 3 × 10−2. Radiation exposure to the operator can be reduced to levels as low as reasonably achievable by improving operator awareness, maximizing radiation shielding on the patient and at table side, maximizing distance between the operator and the operative field, and judiciously using fluoroscopy to minimize the exposure times. The latter objective can be achieved readily by modifying the cement injection technique so that small boluses of cement can be safely injected with syringes in vertebroplasty or bone-filler devices in kyphoplasty, allowing intermittent as opposed to continuous fluoroscopic monitoring. In this study, it was possible to keep operator radiation exposure to rates less than 1 μSv per minute on a biplane fluoroscopic system with pulsed fluoroscopy at 7.5 per second with either the kyphoplasty procedure or vertebroplasty, by using 1-mL syringes. Accepted after revision August 23, 2005.